I I swear I feel like I'm being trolled every time I see this. What a ridiculous product. The retheming is fine, it's just the weird insistence on keeping the "Love Letter" name intact. 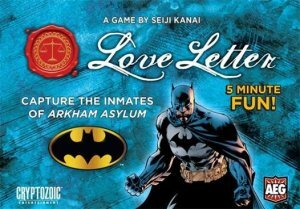 Batman seems to be too obsessed with crime-fighting to have a love life. It's something that sets him apart from most super-heroes. "You know, I dig Roborally, I just don't find myself..."
"The obvious bit about Space Hulk, is that it is..."
"...because I think this game could have made a bigger..."